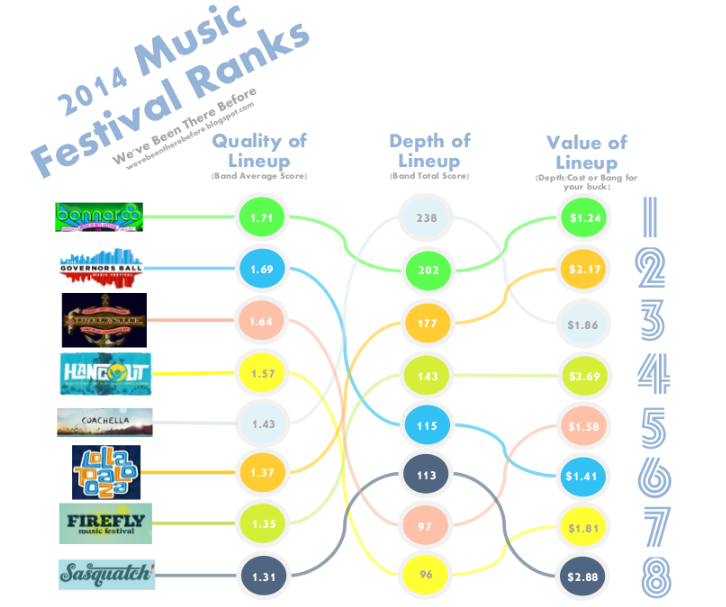 Labels: 2014 Music Festival Lineup Rankings, Bonnaroo, Coachella, concert, Firefly, Forecastle, Governors Ball, Hangout Fest, Lollapalooza, Music Calculator, music festival, music festival review, Sasquatch! You should add a measurement of how many bands will inevitably conflict at the huge festivals. What is the point of awarding positive value for artist quality and depth, when one festival has 2 stage and the next has 10? That shifts everything because why should a festival receive a better score because acts are there that are literally impossible for one person to see? Or is this about saying you were at a festival that the greatest amount of prominent critically acclaimed acts are at? If it's about seeing the most amount of acts for your buck, I believe this is a flawed calculation as it stands.